Posted on Thursday, April 12th, 2012 at 6:23 am by Pieter van der Westhuizen. Back in July 2010 I showed how using Add-in Express 2010, you can easily build additional integrations between Microsoft Outlook and Microsoft Dynamics CRM. 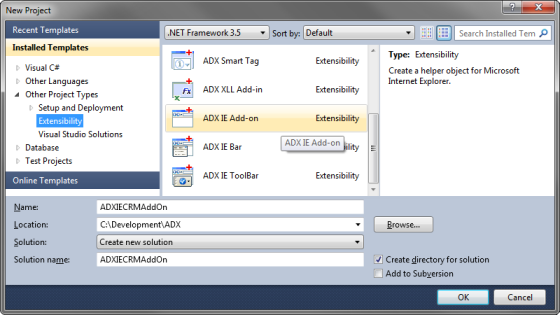 In today’s post I’ll show you how to write another integration to Dynamics CRM, only this time it is using Add-in Express for Internet Explorer and .net. 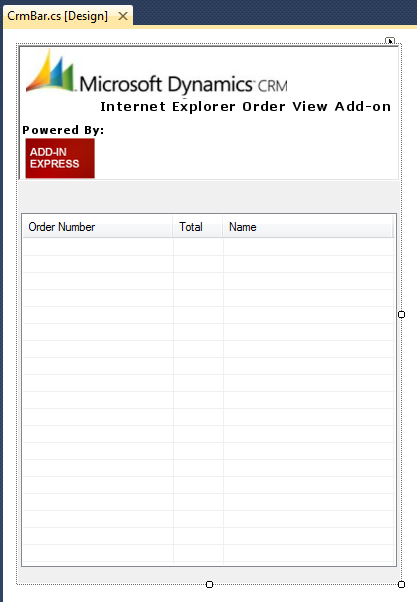 We will write an add-on for Internet Explorer which will show the selected contact in Dynamics CRM’s orders on an IE bar. 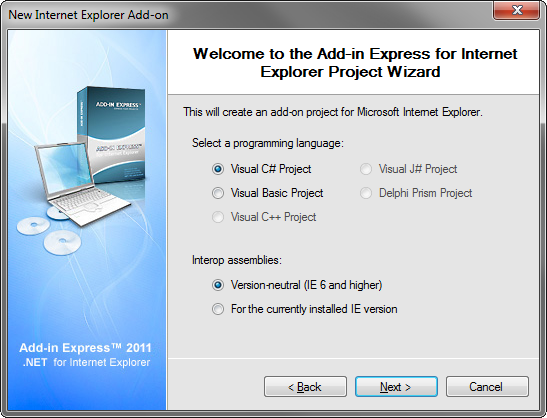 Start by creating a new Add-in Express IE Add-on in Visual Studio. C# will be our language of choice and the add-in will be version-neutral. Design the Explorer bar. I’ve added some branding and a list view which will display the customers’ orders. Next, switch back to the IEModule designer surface and click on the ellipses(…) button in the Bars property. Set the BarType property to the name of the IE Bar you’ve added previously and the MenuText and Title property to Add-in Express Dynamics CRM Order View. Finally set the LoadAtStartup property to True. 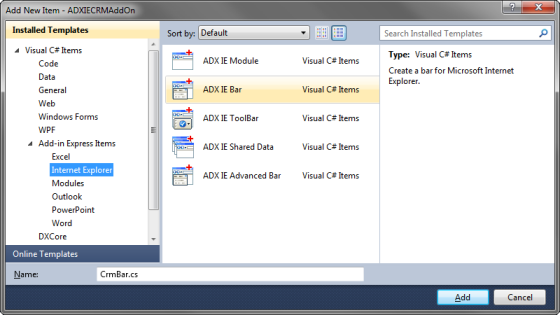 Setting the AddToolButton property to True will add a menu entry for your add-in to Internet Explorers’ command bar. We will need to respond to Internet Explorer events; in order to accomplish this add a new ADXIEHTMLDocEvents component to the IEModule designer surface and set its SupportedEvents property to TableRow. Next, generate an event handler for the OnPropertyChange event by double clicking next to its name in the events list of the property grid. If you look at the page source of the Contacts view of Dynamics CRM, you’ll notice that the selected contacts TableRow(TR) element has a class name of ms-crm-list-SelectedRow. In the following code we will check whether the TableRow element that changed actually has that class name, and if it does we will grab the selected contacts’ id and load their associated account’s orders in the listview.